Emly Starr was born as Marie-Christine Mareel in Laarne, Belgium on September 5, 1957. Her music career started in 1976 with the single 'Tears of gold'. After five years, she represented Belgium during the 1981 Eurovision Song Contest with the song 'Samson'. The song finished in 13th place, in a field of 20 participants. 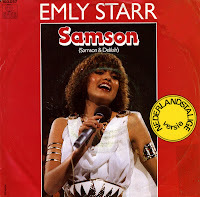 The song is inspired by the Biblical story of Samson, with Starr singing that the object of her desires is like Samson in that he is not interested in love. She suggests that he should 'find yourself a Delilah'. This single features the Dutch and English version of the track.